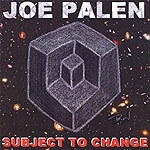 CD review: "Subject to Change"
Joe Palen's debut has a charming homemade roughness to it that hearkens back to 1980s college radio. The 40-something Oceanside resident accompanies his singing on guitar, and while he's got a nice, clean singing voice, the urgency of his autobiographical songs and the jangly guitar give this seven-song release a bit of an edge. The melodies are pretty simple, but catchy; the arrangements and production seem a bit thin. Part of it is that Palen's simply not as good a guitarist as he is a singer, so his fills on guitar struggle to hold the listener's attention until he begins singing again. But the evidence on this disc suggests someone who'd offer a fun live show, something his MySpace page and Web site suggest he does too infrequently.